This concert was on October 18, but the demands of remunerative work and of keeping the Brooklyn Heights Blog going have delayed my review. Nevertheless, I think it's still a useful exercise, as I want to do what I can to raise awareness of the work of the Repast Baroque Ensemble. The Ensemble are, from left to right in the photo, Katie Rietman on cello, Gabe Shuford on harpsichord, Amelia Roosevelt on violin, and Stephanie Corwin on bassoon. Bassoon? If you're thinking this is a departure from the usual baroque chamber music lineup, you're right. The lineup can change from concert to concert. In this concert, Ms. Rietman was allowed a break and her place taken temporarily by Sarah Stone, who played a viola da gamba, or viol, an instrument roughly the size of a cello that originated in the fifteenth century. Also, Ms. Roosevelt was joined on violin by Beth Wenstrom. The theme of the concert was an examination of Baroque era French and German composers' reactions to music of other cultures. The first part featured works by French composers that reflect what Ms. Roosevelt called "the French fascination with the distant and exotic." The first piece was Jean-Baptiste Lully's "March for the Celebration of the Turks," from the comédie-ballet (a play with sung and danced interludes) Lully co-wrote with Molière, Le Bourgeois Gentilhomme. The plot concerns a social climber who is convinced by a con artist that he can arrange a marriage of the victim's daughter to a Turkish prince. My notes on the piece, hastily scribbled on the concert program, are "Stately; European." The music didn't sound to me to be especially Turkish; still, the Turks were something of a European power, and aspired to be a greater one, at the time. You can hear it here, as part of a scene in the movie Tous les matins du monde, and decide for yourself. Repast's ensemble was much smaller than that seen in the movie clip, but played the piece with authority. The second piece was Jean-Philippe Rameau's Timbourin en Rondeau, part of an Opera-Ballet, Les fêtes d'Hébé, that is based on Greek mythology. The Timbourin, nevertheless, seems influenced by Native American music. It provided an opportunity for Mr. Shuford to leave his keyboard and show his skill at playing a hand drum. This was followed by another Rameau composition, Air tendre, from his opera Dardanus, also on a Greek mythological theme. This was done as a duet between Ms. Corwin's bassoon and Ms. Roosevelt's violin; my note was, "Interesting counterpoint." Two more French pieces finished the concert's first half. Jean-Pierre Guignon's Les Sauvages is a duet for two violins which Ms. Roosevelt and Ms. Wenstrom played with alacrity. My notes: "Swooping at first, then frenetic, wild, but with dreamy interludes." Then came another Rameau: Pièce de clavecin en concert No. 3, in A Major, for harpsichord, violin, and viola da gamba. This was in three movements. For the first, La Lapopliniere, my notes were "Bouncy; lilting." For the second, La Timide, they were "Anxious; then aspiring, optimistic." The third, Les Timbourins, was "Stirring." Suffice it to say that there is much in this music that is good, if it is handled properly. Since this time I have written various large concertos and trios in this style, clothing them in Italian dress with alternating Adagios and Allegros. The first Telemann piece was his Duo for Two Flutes in E Minor, TWV40:142, performed with alacrity as a violin duet by Ms. Roosevelt and Ms. Wenstrom. My note for the first movement, Piacevole, is "Sorrowful"; for the second, Andante, it's "Graceful"; and for the third, Scherzando, it's "Danceable." Repast's concerts typically include a piece that allows Mr. Shuford to escape the relative anonymity of providing continuo and to showcase his keyboard virtuosity. The second Telemann piece, Ouverture Burlesque for solo harpsichord, TWV32:2, provided this opportunity, and Mr. Shuford responded masterfully. My note: "Also danceable but courtly, then livelier and playful." The third piece, Concerto Polonoise in B-flat Major, TWV43:B3, has four movements. The first, Polonoise, elicited another "Playful"; the second, Allegro, "Loping, swings"; the third, Largo, "Soulful"; and the final, another Allegro, "Peppy, rocks!" The concert concluded with Telemann's Chaconne Comique in A Major, TWV21:8, from his comic opera Der neumodische Liebhaber Damon ("The Newfangled Lover Damon"). My note on this was, simply, "Delightful." Repast's next concerts will be in March of 2019. The theme will be Wanderlust, "explor[ing] the German fascination with nature and escapism, with inspired repertoire from the early Baroque as well as the early romantic periods." On Thursday evening, March 14 at 8:00 they will be at McKinney Chapel, First Unitarian Church, 116 Pierrepont Street, Brooklyn; you may buy tickets here; on Friday evening, March 15 at 8:00 they will be at Advent Lutheran Church, 2504 Broadway, in Manhattan; you may buy tickets here. Tree of Life: a massacre of the aged. When I saw that the names of those who died in yesterday's mass murder at the Tree of Life Synagogue in Pittsburgh had been published, I turned to it with trepidation. "Any children, teenagers, young parents?" I wondered. There were none of those, but what I found was deeply saddening in another way. 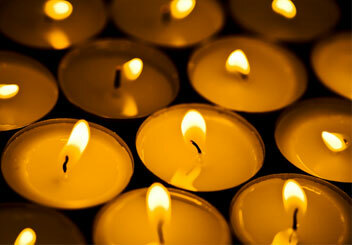 The youngest victims were two brothers, Cecil and David Rosenthal, both in their fifties. There were several people in their sixties and seventies, and three in their eighties, including a married couple, Bernice and Sylvan Simon. The oldest was Rose Mallinger, 97. The full list is here. By coincidence, this afternoon my wife and I attended a memorial service for a woman we had known for years at Grace Church and through events at the Beaux Arts Society. She was 97 when she died. She had suffered illness for some time before her death, but she passed peacefully, in the company of her son, daughter, grandchildren, and great grandchildren, all of whom gave moving testimonials at the service to her loving effect on their lives. Hearing that our friend was 97 at her death made me think of Rose Mallinger. She would have been a young adult at the time of the Holocaust, though she may have passed that time in the safety of Pittsburgh. If so, she would have learned about it later. perhaps not until several years after VE Day. I have a copy of Life magazine's Picture History of World War II, published in 1950, which includes a photo taken in a just liberated Nazi concentration camp, that shows emaciated bodies in a heap. The caption describes them as "people Hitler didn't like." The notion that Jews were the principal, though not the sole, victims of the Nazi extermination program, was slow to be publicized. Rose may have learned early on, by informal channels of communication through family members who escaped in time. However and whenever she learned, she almost certainly felt a mixture of profound sorrow and relief that she had passed that time in a safe place. What were her last few moments like? Hearing gunshots, trying to urge her aged frame to safety, the searing pain as the bullet, or bullets, invaded her body. What was her last thought? I can't imagine. I do know she was denied the death our friend had, and those who loved her, as I'm sure there were many, were denied the chance to be with her in her last moments. Image: "The Kaddish Prayer" in My Jewish Learning. Richard Nelson's Uncle Vanya, at Hunter College, with Jay O. Sanders. I saw this play, a new adaptation of Anton Chekhov's classic, in previews several weeks ago, and meant to post about it, because it is magnificent. Unfortunately, life got in the way of doing the post. Now I've learned that its run has been extended until October 28, so I've got my chance to tell you how great I think it is, and urge you, if you're in the New York City area between now and the 28th, to go and enjoy it. My initial motivation to see it was that my friend Jay O. Sanders (photo) plays the title role. My wife and I have known Jay, and his wife Maryann Plunkett, since our daughter and their son, Jamie Sanders, now having a successful acting career of his own, were friends in elementary school. I was also attracted by its being directed by Richard Nelson, two of whose Apple family plays, also featuring Jay, along with Maryann, I saw staged at the Public Theater. "Staged" is a misstatement here: Nelson likes to set his plays on a floor with seats surrounding it; the front row of seats is on the same level as the actors. Nelson is a master of intimate family drama, and this "theater in the round" presentation, in which the actors sometimes turn to address the audience directly, makes it all the more intimate. This does very well for Chekhov's play, which has the same intimacy as Nelson's earlier family dramas. For criticism, I can't do better than Ben Brantley in the New York Times. I want to add a special mention of Yvonne Woods, who plays the part of Vanya's niece, Sonya. The entire cast (Jay, whom Brantley credits with "a career high performance," included) is brilliant, but Ms. Woods anchors the play. Her subtly presented story of a life of unsatisfied longings, endured stoically ("pinched with care" is Brantley's description), seemed to me, despite Vanya's cry from the heart near the play's conclusion, the most eloquent presentation of the tragic circumstances in which all the characters have put themselves. Her centrality is emphasized by the list of characters in the play's program, in which all but her and Astrov, the physician for whose love she unsuccessfully longs, are defined by their relationships to her. She is the only one who can call Vanya "Uncle." It's late, and given the time difference between here and Ireland (if that's where he's been celebrating his birthday) this may be a belated wish. Still, I think he'll forgive me, if I express another debt of gratitude for all that his music has done for me since that afternoon in Cambridge, Massachusetts in early September of 1967, when, while savoring my first roast beef with Russian dressing on a bulkie roll (a Boston specialty which I, a newly expat Floridian, had never tried before), I heard "Brown Eyed Girl" on the jukebox. Yes, at 72 he had the confidence to cover a Sam Cooke classic, and to do it well. Leonard Bernstein (1918-1990) was the greatest American composer, conductor, and musician of the second half of the twentieth century. The centenary of his birth was on Saturday. Below is a clip of "Wrong Note Rag" from Wonderful Town (1953), a tribute to my adopted city, music by Bernstein with lyrics by Betty Comden and Adolph Green. It features a duet between Audra McDonald and Kim Criswell, backed by European Voices with Simon Halsey as Chorus Master, and the Berliner Philharmoniker under the direction of Sir Simon Rattle. Bertrand Russell on growing old. Bertrand Russell was one of the pre-eminent philosophers of the past century. Although much of his work was devoted to analytical philosophy, particularly to exploring the logical foundations of mathematics, he also wrote and spoke eloquently and with wit about ethical and political matters, and about concerns of everyday life. "Make your interests gradually wider and more impersonal, until bit by bit the walls of the ego recede, and your life becomes increasingly merged in the universal life. An individual human existence should be like a river — small at first, narrowly contained within its banks, and rushing passionately past rocks and over waterfalls. Gradually the river grows wider, the banks recede, the waters flow more quietly, and in the end, without any visible break, they become merged in the sea, and painlessly lose their individual being." I'm indebted for the Russell quotation to Maria Popova's blog Brain Pickings, which I find a reliable source of thought provoking insights. If you follow the link and scroll down, you can subscribe for free. Maria relies on donations to keep up her very valuable work and, if you would like to help, please follow the link provided on her blog. 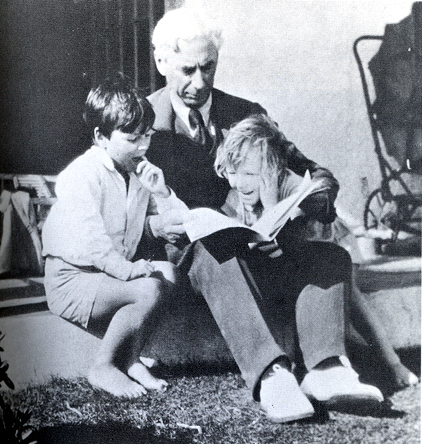 The photo (public domain; photographer unknown) is of Russell with his children John (born 1921) and Kate (1923). Judging by the children's appearances, the photo was made in the late 1920s when Russell (born 1872) would have been in his mid-fifties. Repast Baroque Ensemble's "Bohemian Fantasy" features works by Biber, Schmelzer, Buxtehude, Finger, and Purcell. 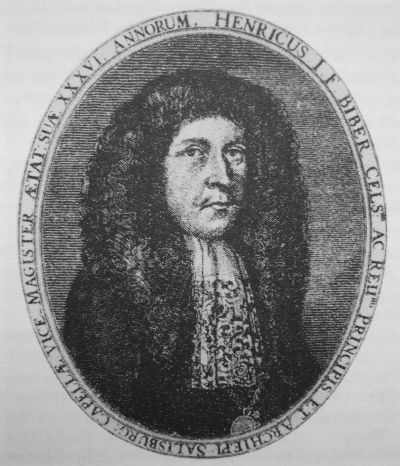 Heinrich Ignaz Franz von Biber was a true Bohemian; that is, he was born and raised in Bohemia, then a German speaking enclave in what is now the Czech Republic. 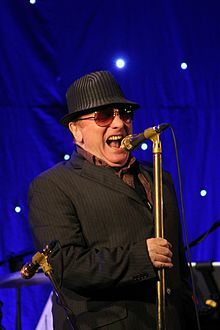 Most of his musical career, however, was spent in Salzburg, Austria. Biber's music is not as well known today as is that of his near contemporaries J.S. Bach, Handel, Telemann, and Vivaldi, except perhaps among music historians and Baroque aficionados. Nevertheless, he was quite creative, using novel tunings and techniques. His music was the inspiration for this concert, although he is the only Bohemian among the five composers whose works were represented in it. Repast's performance of Biber's works was at their usual standard of excellence. For this concert, they were joined by violist Jessica Troy, whose playing fit seamlessly in the group's style. None of the works in the concert called for a bassoon, so Stephanie Corwin was afforded an opportunity to travel. Biber's Fidicinium Sacro-Profanum #11 in C minor (the Latin title translates loosely as "Sacred and Profane Fiddle Music") got the program going on a lively note, using a rhythmic technique he called "Harpeggio". His Praeludium from Partita No. 6 (from the Harmonia Artificioso Ariosa was dance music, also very lively. The Mensa Sonora in A minor No. 3 is described in the notes I took during the concert as "swooping - gentle". The Passacaglia in G minor for solo violin gave Amelia Roosevelt a chance to do a star turn, and she handled it with her usual aplomb. My notes include the words "twittering flourishes". The Balletti Lamentabili was in six short parts of which I made the following notes: "(1) contemplative, (2) steady, (3) aspiring, (4) sprightly, (5) emotive, (6) sorrowful". Johann Heinrich Schmelzer was an Austrian born composer almost all of whose career was spent at the courts of the successive Hapsburg emperors Ferdinand II and III, and Leopold I, the last of whom ennobled him and gave him the rank of Kappelmeister. Unfortunately, this happened just a year before Schmelzer's life was cut short by a plague epidemic. The death of his second emperor occasioned his composition of the Lamento sopra la morte Ferdinand III. My notes on this were: "mournful, lively at end - ascent?" The final movement may express Ferdinand's spirit ascending to the realm of glory. Schmelzer's Polnische Sackpfeifen ("Polish Bagpipes") was given pride of place as the final work in the concert. My notes: "Puff! Puff! Puff! chanting melodies; round with violin and viola, and cello". The cello was played superbly, as always, by Katie Reitman. Dietrich Buxtehude, whose birthplace and nationality were disputed (Danish or German?) was a superb composer and organist. It's said that J.S. Bach walked 250 miles to hear Buxtehude play. Buxtehude's Toccata in G major for solo harpsichord, BuxWV 165, gave Gabe Shuford his opportunity to break from continuo and show his considerable talent, which he did to full effect. Gottfried Finger was born in Moravia, now also part of the Czech Republic, but spent much of his musical career in London. His "Sonata Op. 1 No.4 in B flat major" got my notes "ethereal to upbeat." Henry Purcell was considered the greatest of British Baroque composers. His production of orchestral, chamber, and operatic works during his too short life (1659-1695) was prodigious but also of great quality. Repast performed his Fantasia in A minor for 4 parts; the only "Fantasy" in this concert. My notes: "languid; dreamlike until final". This was a superb concert. Repast's concert schedule will resume in the fall; I'll keep you advised as soon as details are available. Mets win opener; lose an icon. The Mets won their season opener, at home, today, beating the Cardinals 9-4. 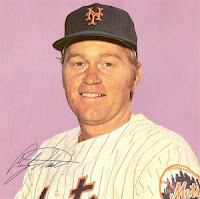 I was at work while they were playing, so all I know is the score and, from their website, that Syndergaard got ten Ks, although giving up all of the Cards' four runs. The bullpen, evidently, was strong. Repast Baroque Ensemble's "Dresden Fireworks" illuminated little known works and often overlooked instruments. Some wag -- probably a frustrated clarinet or English horn player -- once defined the oboe as "an ill wind that nobody blows good." 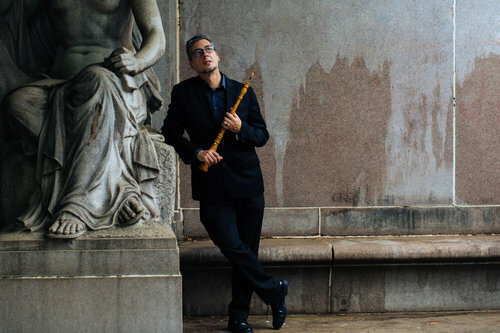 That gag was put to rest at the Repast Baroque Ensemble's "Dresden Fireworks" concert at First Unitarian Church in Brooklyn Heights on Friday, March 2, which featured guest oboist Geoffrey Burgess (photo). Mr. Burgess ably demonstrated his mastery of the instrument, as well as its range and versatility. Repast's regular crew --Amelia Roosevelt on violin, Stephanie Corwin on bassoon, Katie Reitman on cello, and Gabe Shuford on harpsichord -- were also on top of their game. As the title suggests, the playlist was of works by composers who were active at the Dresden court of the electors of Saxony and Polish kings during the baroque era -- the early 18th century -- with one exception. That was Vivaldi, who never visited Dresden, but whose music was greatly admired there. The others were: Johann Friederich Fasch; Francesco Maria Veracini (whose stormy engagement in Dresden ended with his self-defenestration from a third story window, fracturing a leg and hip); Wilhelm Friedemann Bach, eldest son of Johann Sebastian Bach; and Jan Dismas Zelenka. The first piece on the program, Fasch's Sonata in F Major for Violin, Oboe, Bassoon, and Continuo, begins with the bassoon playing solo, then joined by the oboe, violin and continuo (cello and harpsichord) in a lush, romantic series of variations. The second movement features lively interplay among the bassoon, oboe, and violin. The third is contemplative, with the oboe dominant, and the final movement is sprightly. The Vivaldi Sonata in C Minor for Oboe and Continuo begins with a mournful slow march, begun by the bassoon, then joined by the oboe. By contrast, the second movement is upbeat, with the oboe leading from the start. The third is restful, but gave Mr. Burgess the opportunity to demonstrate the oboe's range, and the frenetic fourth movement allowed him to show his virtuosity to the fullest. Ms. Roosevelt described Francesco Maria Veracini as "certifiably crazy." The first movement of his Sonata in E Minor for Violin and Continuo begins at a loping pace, then picks up to a fast canter, then back to a slower lope. The second is dreamlike, with Ms. Roosevelt's violin carrying the mood superbly. Her violin is decisive in the third, and final, movement, which is stormy, perhaps reflecting the composer's inner turmoil. Fasch's Sonata in C Major for bassoon and continuo gave Ms. Corwin and her instrument an opportunity to be in the foreground. The first movement is mellow, a quality associated with the bassoon, but the second is bouncy, allowing Ms. Corwin to demonstrate the instrument's range. The third is reflective, with the lower range dominant. The fourth is playful and rapid, showcasing Ms. Corwin's dexterity. Just as Ms. Corwin got her star turn thanks to Fasch, Mr. Shuford got his with WF Bach's Fantasia in A Minor for Harpsichord. 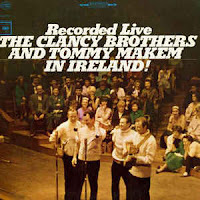 Each note seemed to race from the keyboard to the string to the sounding board in an effort to beat the one before it. A bravura performance. Before this concert, I was ignorant of the works of the Czech composer Jan Dismas Zelenka. His Trio in B-flat Major No. 3, for Oboe, Violin, Bassoon, and Continuo convinced me that I need to hear more. The first movement is languid, with the instruments seeming to perform a slow dance. In the second, the bassoon picks up the pace, followed by lively interplay between oboe and violin. The third is pensive, giving Mr. Burgess another chance to show the oboe's range. The last movement starts with a duet between violin and bassoon, then the oboe joins in a rollicking finale that had me wanting to dance in the aisle. Throughout, Ms. Reitman's cello, along with Mr. Shuford's harpsichord, provided a strong and reassuring sonic base over which the other musicians performed. Repast's next concert is titled "Bohemian Fantasy" and will include compositions by Biber, Schmelzer, Purcell, and an original work by Repast. It will feature guest violist Jessica Troy. Performances will be at 8:00 PM on Friday, May 4 at the McKinney Chapel, First Unitarian Church, 119 Pierrepont Street, Brooklyn, and at 8:00 PM on Saturday, May 5 at Advent Lutheran Church, 2504 Broadway (at 93rd Street), in Manhattan. On May 6, 1954 I was eight years and not quite two months old. My parents and I were preparing for a European vacation before returning to the U.S., as my father's tour of duty in England was ending. The next day, I looked at a newspaper and saw a photo of man with long, flowing hair running toward a finish line alone. The headline said he was Roger Bannister, and that he was first (since records had been kept) to run a mile in less than four minutes. I knew roughly how long a mile is; I'd been told that it was a mile from the railroad station to the paper mill in my mother's hometown, Tyrone, Pennsylvania, where she and I had sojourned with my grandmother for several months before joining my father in England. It wasn't a great distance to walk; I'd done it once. It did seem to me a long way to run. Like most kids, I ran a lot, but in short bursts, either playing tag or what we call soccer and my English schoolmates called football. 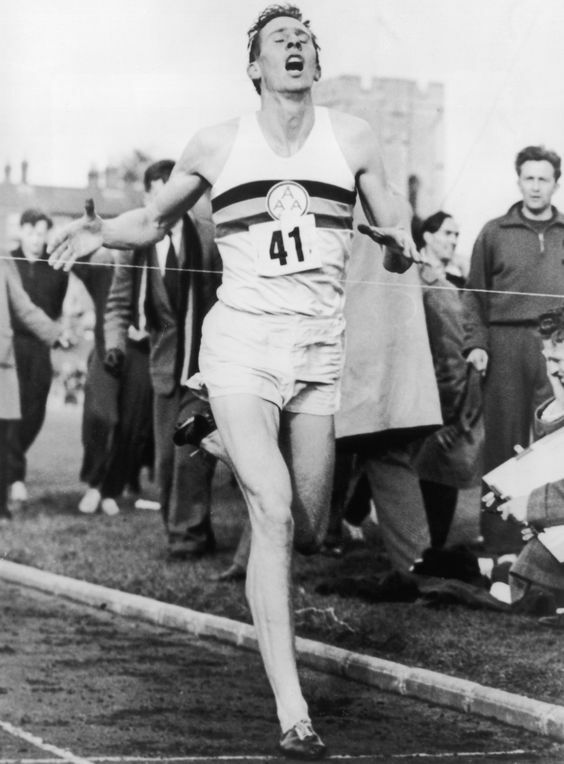 For some reason that image of Bannister running alone to the finish line remained engraved in my memory. As I grew older, I began running on my own. In my senior year of high school, I would run in the morning before breakfast and in the evening after supper, following a course through our neighborhood that may have been a good half mile. Looking back, I regret not having tried out for my school's track team. At the time, I was shy about pitting myself against competition, fearing I might not be as good as I hoped. Roger Bannister, since 1975 Sir Roger, died Saturday at the age of 88. His New York Times obituary tells much that I didn't know about his later life. When he broke the record, he was a medical student. Not long after, he left competitive running to devote himself to a successful medical career. He didn't entirely leave the world of sports, serving for three years as chairman of the British Sports Council and for seven as president of the International Council of Sport Science and Physical Recreation. For three years, he was head of Pembroke College, Oxford. Mavis Staples, "We Shall Not Be Moved." 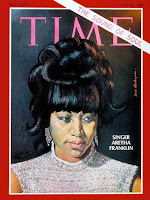 In the clip below, Mavis Staples sings a song that's perhaps more timely now than since the years leading up to the passage of the Civil Rights and Voting Rights acts. The music is accompanied by a still photo of Dr. Martin Luther King, Jr., whom we celebrate today. 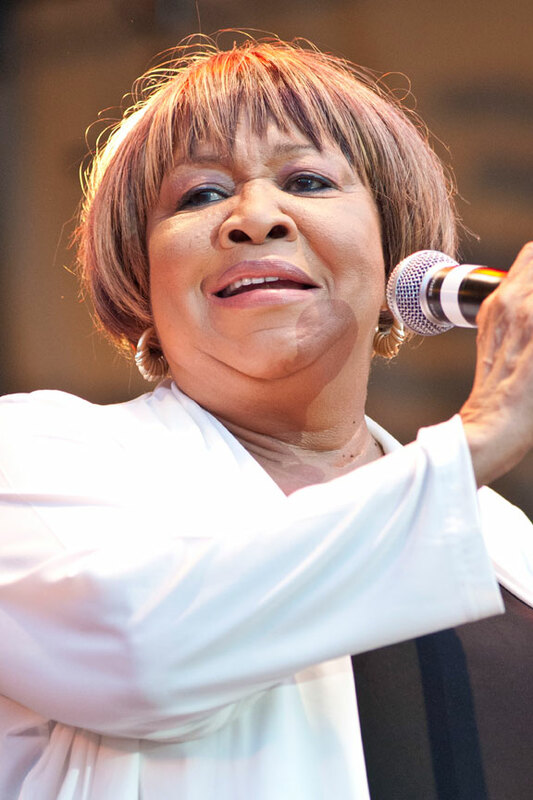 Photo of Mavis Staples by Adam Bielawski.